ZAKARIA: Ladies and gentlemen, welcome to this very special meeting of the Council on Foreign Relations. We are very lucky to have with us a very special and distinguished guest. I met our current speaker before he was president, before he was prime minister, at the Davos that was held in New York after 9/11, when three Turkish politicians requested to see me to convince me that they were founding a new party and planning to modernize Turkey. Tayyip Erdogan was one of them. He of course became prime minister of Turkey, and has recently been elected president of Turkey. I think it would be fair to say, without any exaggeration, that President Erdogan is the most important Turkish political figure since Kemal Atatürk, the founder of the republic. Under his tenure as prime minister and now president, Turkey’s economy has, depending on how you count it, tripled in size. Per capita GDP has quadrupled. Turkey has become one of the leading players in the region, if not the world. I don’t think there is any need to make much more of an introduction. As I said, you have before you the most important politician in Turkey’s history since its founding father. And of course, Turkey sits at the midst of almost all the great currents that are roiling the Middle East, from Iran, to Syria, to Iraq, and of course, including the Israeli-Palestinian issue. The format for this meeting is as follows. The president will make a few opening remarks from this podium. He will then join me at the — on the stage. We’ll have a conversation for about 15 minutes. We’ll then open the conversation to all of you. And this is being streamed to our Washington offices as well. The entire meeting, his speech, comments with me and the comments in response to your questions are all on the record. Without any further ado, his excellency, President Erdogan. ERDOGAN (through translator): Distinguished members of the Council on Foreign Relations, distinguished participants, ladies and gentlemen, I would like to greet you all wholeheartedly and express my gratitude and thanks to the Council on Foreign Relations for organizing this very important meeting. We have had in the past occasion to have exchange of views and opinions here in Turkey and also — here and also in Turkey in the past with CFR, one of the most important think tanks in the United States. We’re going through a very important period in our region of the world, and I believe that the fact that we are gathered here today to discuss these important developments will be an important opportunity to evaluate the situation and the developments in the best way possible. I’d like to start my remarks by reminding you of the fact that this year marks the centenary of the beginning of World War I. Turkey, or the Ottoman State, as it was known a hundred years ago, was an important party to the first World War, and was the country that was perhaps most affected by that war. At the beginning of the 20th century, borders of the Ottoman State began on the east, from the Iranian border today, and it went to close to Vienna in Europe. In North Africa, the borders were in Tunisia and Algeria. And in the north, it went as north as Crimea, and in the south, to Yemen. In other words, all the way to the Indian Ocean. At the end of World War I, in 1918, Turkey’s border shrank to what it is today. The reason why I make this reference is because we see significant crisis taking place in the Middle East and Eastern Europe today, and up until 100 years ago, these areas were governed by — from the Ottoman capital, Istanbul. The Ottoman State had a very successful administration system, and for centuries, these areas of crisis today had maintained their existence without problems. The Palestinian issue, the problems in Iraq and Syria, Crimea, Balkans, are all issues that came about after the dissolution of the Ottoman Empire. Therefore, they date back to about 100 years ago. Turkey won its war of independence in 1922 and become an independent state in 1923. And throughout our history, in the last 91 years, we have established relations with countries in the region based on mutual respect and tolerance. And I would like to specifically underline the fact that we have always been very sensitive and respectful of the independence and territorial integrity of each and every country. And today too, we view the — all the states and peoples that used to make up the rest of the Ottoman — what was then the Ottoman Empire, with peace, friendship, and solidarity. And we respect their territorial integrity. The reason why I make this point is to be able to say that Turkey is a country which best knows, understands, and analyzes the geography that it’s in, because we share a common history with every country and peoples in the region, including those areas of crises. At the same time, we share religious and cultural values with all the countries and peoples in the region. And we have always tried to put this important experience into good use in order to actively help resolve crises in the region, and we have always tried to provide as much information as we can based on this experience to the rest of the world. The Middle East has very complicated dynamics, and it’s impossible to resolve the crises in the Middle East without understanding these complicated dynamics and the sentiment there. So, Turkey has this knowledge and experience, and has been sharing this experience and knowledge with the United States, within the framework of a model partnership. In fact, this information and experience that we have constitutes a very unique opportunity for the European Union as well. In addition to many other benefits, Turkey has the added advantage of being able to understand and analyze what’s happening in its region, and that alone should be a very important reason — justification as to why Turkey should become a member of the European Union. Dear friends, we have made some comments, warnings about what could happen with respect to the Arab awakening, and those were not taken into consideration. We made some appeals regarding what was happening in Egypt, but they were not taken in to consideration. When the crisis began in Syria, we warned Assad and the rest of the world in the most sincere way that we could, but unfortunately, those were not taken into consideration, and we are faced with this painful situation that we’re all faced with today. We understand the view, the sentiments of all the parties in Iraq, and we have made some significant points with reference to the situation in Iraq. We made a lot of comments. We sounded warning bells, but unfortunately, necessary measures were not taken. And once again, we are faced with a difficult situation in Iraq. We’re also following — we have been following the developments in the Israeli-Palestinian issue, and we’ve had close contact with all the parties. We will continue to have close contacts with all the parties. And we have made necessary — we have made always made the necessary warning signs or shown the necessary warning signs to all the parties, and Israel also, with regard to what could be done to resolve the problems there. What happened in Libya was not unforeseeable. What happened in Egypt and what is now creating — what is hurting the conscience of all the region happened with all of us watching. And the lack of interest on the part of the modern world on the Syrian crisis led to hundreds of thousands of people dying, and 6 million people being displaced, and a result of this lack of interest on the part of the modern world, the situation there has become a tragedy. And the uncompromising, self-centered, and irresponsible behavior of the previous government in Iraq has laid the foundations of the current situation there. The Palestinian issue is an important issue that has an impact not just on the Palestinians, but on all the Muslims and everyone who has a conscience in the world. And in fact, the Palestinian issue lies in the heart of many of the issues in the region. And the Israeli government, although they know this sensitivity very well, have not refrained from putting its own people and the people of the region in fire. What I’d like to say here is that I make a distinction here between the people of Israel and the administration, the government in Israel. And I underline this point in order to be better understood, because with respect to the steps taken in the region, there have been various comments made about Turkey and about myself. And that is that I am very sad to see that my country, myself, and my colleagues, sometimes, are labeled as being anti-Semitic. But Turkey, in no part of its history, has ever been racist. It has never been anti-Semitic in any time in its history. Maybe I am one of the first prime ministers in the world to have said that anti-Semitism is a crime against humanity. And because Turkey, its people and its state, have always stood with the oppressed. When the Jews were under pressure or oppressed, Turkey extended a helping hand to them. When Jews were expelled from Spain in the 15th century, they sought refuge in Ottoman territory, and they lived peacefully there for centuries. In the same way, our country embraced the Jews who were fleeing Hitler’s persecution. There are times when I personally am labeled as an anti-Semitic person. Criticizing Israel’s massacres that defy international law, trample on human rights and life is not anti-Semitism. Holding a state that massacres ten people by stopping an international ship taking aid to Gaza isn’t anti-Semitism. And it isn’t anti-Semitism to criticize an administration that massacres, kills babies, children, innocent babies, children, in their homes, mosques, hospitals, schools, beaches, parks, without any discrimination. Our criticism is not directed to the Jews. It is only and solely directed at the Israeli administration and its policies, and no one should distort this. There is a distinction here. Whenever we criticize the massacring of innocent women in Palestine, some circles engage in a campaign to distort the perceptions about Turkey. Whenever we criticize the killing of innocent children, babies, in the Middle East, some media organizations target us. But these smear campaigns, these attempts to distort perception about us, will not take us away from the path which we believe to be true. And I ask you please to not listen to such distortion because we have to live together in the world, which is focused on people, not on interests. So, do not listen to this black propaganda, and do not give premium to such propaganda, because we would like to see peace prevail between Israel and Palestine, just like we would like to see peace prevail on issues, other issues in the region. And we’re pursuing constructive policy in this effort. This ship was taking humanitarian aid, and ten people were murdered, and there was a process that began after this. President Obama got involved. And Prime Minister Netanyahu made an apology and we were expecting to see normalization. And we discussed compensation. We arrived at a reasonable point, and we were talking about the lifting of the blockade. And this was also being discussed. And we had arrived at an agreement, but almost at an agreement, but at just about that time, we saw more settlements being built in the West Bank by Israel, and Israel began to bomb Gaza, and these developments stopped that process of normalization. I would like you to all know that Turkey’s foreign policy is based on international law, justice, and conscience. When we look at Palestine, we don’t see Arab, Sunni, or Hamas. We first and foremost see people. When we look at Iraq, we don’t see Sunni, Shiite, Christian, Kurd, Arab, Yazidi, or oil. We first and foremost see people. In Syria, it’s not the Sunni or the Nosairi, it’s the people who are important to us. If an injustice has been done against a Christian, then Turkey will stand by that Christian. 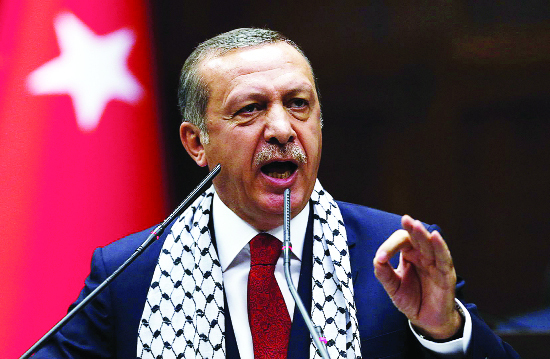 If he is a Jew, Turkey will stand by the Jew. If he is a Muslim, Turkey will stand by that Muslim. At the moment, there are close to 1.5 million Syrians that are sheltered in Turkey. But 1,300,000 of them have arrived from Syria. About 120,000 are Syrian Kurds. And I was given information today that the number of Yazidis went from 30,000 to 60,000. They are not of the same religion, these people. Not of the same sect. Not of the same race. They don’t speak the same language. But it’s only Turkey which has opened its doors to them: 1.5 million people. How about the number of refugees in Western countries in total? I’ll tell you how many: 130,000. We’ve been setting up tent cities, container cities. We are housing them in school buildings at different locations, and we have so far spent $3.5 trillion. And if you ask me how much support we’ve received from the world in total, it’s $150 million. We pursue an open door policy, which is a testament to our humanitarian nature. But where is the West? Why isn’t the West opening its doors and inviting people in? That’s — this is where the problem lies. Just before leaving for the United States, there were tens of thousands of Syrian Kurds who came to our borders and we opened our borders for them as well. Why? Because they needed a safe place to survive. We provide humanitarian aid to all those in need in Iraq, in Syria. And we are doing the same in every crisis region — in Ukraine, Somalia, (inaudible), Pakistan, in Afghanistan. In 2013, Turkey set aside 21,000 (ph) of its national revenue for humanitarian aid and became the most generous country in the world in this respect. And in 2013, Turkey ranked third after the United States and the U.K. with respect to emergency and humanitarian aid. We are trying to provide as much support as we can without discriminating between race, religion, sect. Let me also catch up on a topical issue here — difference. We have been observing an effort in some circles to try to represent Turkey as supporting terrorism. Some media organizations in the United States, some nongovernmental organizations are targeting Turkey in a planned fashion through unfounded news or publications for slander. On the issue of ISIS, Turkey has been subject to very unjust and ill-intentioned news items from media organizations. Turkey has fought terrorism for many years. We have paid a heavy price in that process. And we were on our own in that effort, and as such — as a country, Turkey can never support any terrorist organization. These are so unfounded, so slanderous. Some claim that we are engaged in an oil trade with ISIS. This is completely unfounded. This is slander. It’s a lie. I say this — I’ve said this many times. Our minister of energy has said this many times. When I was prime minister, I again made reference to these lies and the current prime minister is doing the same. But there are still some who are insisting on this position. Some claim that ISIS militants are being treated in Turkey. And in fact, there was a picture where myself and the prime minister are leaving a mosque after Friday prayers, and that picture appeared in one of the well-known newspapers in the United States as the place where the ISIS terrorist organization was being supported. And then they corrected that item a few days later. So there’s — how can there be such misinformation, such an approach? The consul general — Turkish consul general in Mosul, his family and staff, were held in captivity by ISIS for 102 days until they were released last Saturday. And because of the sensitivity of that situation, and because of the fact that we were very mindful of the safety of our citizens, we acted very carefully and we made some very sensitive statements. But unfortunately, those statements were distorted by some circles. This is a systematic attack on Turkey’s international reputation and also Turkey’s economy. But we will not be affected by these developments. There are some credit rating agencies — they don’t use science or economic data, but they act politically. And they said — they say in the first — for the first six months of this year that Turkey’s economy is stagnant, whereas it has grown by 3.1 percent in the second quarter. On the other hand, you see other countries which — whose economy is about to collapse, and yet their grades are upgraded. These are all political decisions. Can a credit rating agency act so politically? It has to base its decisions on scientific economic data and explain its decision in this way. Economically speaking, we in Turkey have no problem, as has been stated. And our growth trend is successfully moving forward. We will continue to do what we believe is right and we will continue to defend and voice those truths as we have done in the past. At this point, perhaps I should also talk about the parallel state structure in Turkey. And I’d like to remind you of some of the facts regarding this issue. I say this because some media organizations and think tanks in the United States seem to be at least partly under the influence of this organization. Dear friends, there’s an organization that has existed in Turkey for the last 30 years. The head of this organization left Turkey in 1999 and came into the United States, to the state of Pennsylvania from where he has been conducting his activities. Up until recent years, this organization was known in Turkey and in the world as an organization focusing on education and charitable activities. However, as of 2012, it was understood that this organization had evolved into an organized body seeking solely its interests and it became a significant threat as a result of the power that it had gained in some of the countries where it is active. Imagine, for example, the judiciary of a country being under the influence of this organization. The police, for example, act not upon the instructions of their superiors, but based on the instructions they receive from Pennsylvania. How their wives will dress is determined by instructions coming from Pennsylvania. And decisions are made based on the instructions from Pennsylvania. When we first started fighting against this organization, we realized that it wasn’t just the police and the judiciary where they have been active and where they have infiltrated. We have seen that they are also active in many critical areas of the state. Their activities have transcended national borders, according to our findings, and they act as subcontractors for international intelligence. Senators, congressmen from the United States have been welcomed on trips to Turkey. We received those delegations. And then in December of 2013, they arranged an attack on the government. It was an effort — an operation to topple the government, disguised as a corruption investigation. So much so that the files had been prepared beforehand about myself, my ministers and my colleagues, and they were all prepared before the operation. And in those files, I was mentioned as the prime minister of the time. And the ministers were mentioned as such. And we have been taking some very determined measures with respect to this organization, which constitutes a threat to our national security. And in our national security council, we have taken the decision to take necessary measures to counter their threat. This very dangerous organization is used by our opposition as a suitable subcontractor, both in Turkey and elsewhere around the world, including in the United States. And I would like to say that this organization cannot be trusted, based on their goals and activities, and they will stab those who work with them in the future. We think that they resemble the — an organization which was called Hashashim in the 11th century. Hashashims used to take drugs called hashish and they would organize assassination of statesmen. And the word assassination in English is said to have derived from Hashashim, the word Hashashim. Turkey is firmly working against this organization at this point, and the way it works, the ways it’s organized and its activities are no different than this Hashashim organization. And we have expressed and explained this organization to President Obama and others in the United States, because if we are model partners, if we have a strategic partnership, then — and since we deliver terrorists or anyone that the U.S. would want from us, we would expect the same in return. Somebody who is threatening national security in our country resides in Pennsylvania, and so, we ask that he be deported and that he be given to us. That’s what befits a model partnership. I hope that the Turkish and the U.S. administrations will cooperate in fighting against this organization, which constitutes a threat to both countries. Dear friends, we have significant experience from our past, and we will continue to make use of it in order to contribute in every way that we can to global peace. And Turkish foreign policy will continue to be based on peace, solidarity, international law and justice, as it has been the case in the past. And Turkey with its democratic standards, which are continuously being developed will continue to be an important example for succeeding in achieving regional and global peace. My request from our friends in the United States is to make your assessment about Turkey by basing your information on objective sources. It is very important that Turkey’s relations with the United States are not distorted by prejudice or other attempts at changing perceptions, or lies. I am the first popularly elected president in Turkey. In the past, the parliament in Turkey elected the president. In elections in August of this year, the people for the first time voted for a president, and Turkey elected its president with 52 percent of the votes — elected me as president, 52 percent of votes. And the next contender received 38 percent of the votes, with the third contender receiving about 10 percent of the votes. If we believe in democracy, if we believe that democracy requires respecting the choices of the people, then I am sure that we will work together with the people and the state of the United States because this is the cradle of democracy. And we will work together to do a lot more in the world. And we don’t want the world to be governed by autocratic regimes. I think this will benefit no one. So, we have to work together in order to ensure a better world. We have a similar practice with the United States on many issues, such as democracy, human rights, terrorism, or intervention in demonstrations — violent demonstrations or crimes through the Internet. Government of which I have been prime minister up until a month ago, has always defended that the rule of law in Turkey in the last twelve years, and we have achieved unprecedented progress in the area of democracy and human rights in Turkey, and we will continue to engage in these efforts. Turkey’s democracy, and especially its economy is moving towards the future in a very determined way on a sound basis. We have growth: stable growth. I am sure that when you observe what’s happening in Turkey basing your information on objective sources, you will see Turkey for what it is. Because Turkey is a country which defends peace and democracy, and it’s a country which has a stable economy. And Turkish-U.S. relations, based on mutual respect, common values, and mutual interest, is a very important alliance relationship, which can contribute significantly to the resolution of regional and global problems. To the extent that the Turkish-American alliance takes into consideration mutual issues and bases its relationship on mutual respect, we can achieve a lot more in terms of contributing to regional and global peace and stability. And I hope that think tanks such as CFR, too, will continue to contribute to a greater alliance through their work. ZAKARIA: We have simultaneous translation. I’ve been told to let you know that for the ease of translation, you are to please ask your questions in English. This is on the odd chance that somebody wants to show off and ask the question in Turkish. I’m going to start things off by asking the president a few questions, and then we’ll open it up to the floor. Mr. President, if I may, that was a fascinating address that covered so many different subjects, but I think that the one that many people are wondering about today in light of the extraordinary news over the weekend, the release of Turkey’s forty nine hostages. It’s very simple. ISIS is a very tough organization. They would not give something for nothing. What did you give ISIS? Why did they give back your hostages? ERDOGAN (through translator): Thank you. We did not wait for nothing for 102 days. This process that took 102 days involved an operation by the national intelligence agency. It was a very historic, very important process, and the undersecretary heading the national intelligence agency and his team worked very hard. And they have been very successful. From time to time, you know, people ask how we manage this without holding any discussions. It is of course not possible to reach this result without having discussions. You do have contacts, but who does it, or how does it work? When we say the word “operation,” people only think of air strikes, bombs, aircraft, weaponry. But an operation isn’t only that. Operations are political sometimes, or diplomatic, or civilian. And they involve discussions, contacts. But I can tell you first of all, that we have not had any monetary relationship. That’s clear. Now, as to the rest, you probably cannot expect us to publicly divulge what the intelligence agencies do in their business. But the end result is that forty nine diplomats, consular staff, have been freed. And some say that maybe there has been exchange. You might have an exchange, but it also takes some effort to prepare for such a thing. And efforts have been made and thankfully no harm was done to any single one of the forty nine people. It was just that there was a dog which they had, but we lost him. That’s the only loss. ZAKARIA: But if I may press you, it suggests that you returned some people to ISIS that ISIS wanted. Would that be fair? Were there people that you had in your custody that ISIS wanted who were exchanged? ERDOGAN (through translator): Well, I just said, such things may be possible. As to how — what context, well, I think what’s important is to be well prepared. I’ll give you an example. I wonder if they ask this question to Israel, who released 1,500 people for one hostage? 1,500 people for one hostage. Israel did it. So it’s possible. ERDOGAN (through translator): I guess I have made my point. QUESTION: There are ten Arab countries that have signed up to — to fight and to struggle against ISIS along with the United States. Turkey did not join that list. And it has led people to wonder whether Turkey was doing that because there was some kind of deal. Will Turkey join the fight against ISIS as part of that group? ERDOGAN (through translator): Our foreign minister went to this meeting in Jeddah, and the foreign minister was there — he was involved. And we said that we would only provide humanitarian support to such a coalition at the time when we had forty nine hostages. And secretary of state, Mr. Kerry visited me at the time, and I told him the same. I said that we would contribute to the humanitarian side, but that we would not be involved in other aspects at that point. And in our meeting then, I said that we could talk about many issues after we secured a release of the forty nine hostages. And the Turkish and American officials are talking to each other as we speak, and those discussions will continue. We have no hesitation whatsoever with respect to fighting against terrorism. We have no weakness vis-a-vis terrorism, because we are a country which has had to deal with terrorism. And we’ve lost 40,000 lives to that effort. And it is impossible for us to view any terrorist organization in the region positively. QUESTION: A question that I think many around the world now have is about the Syrian moderates. And long before we started talking about this, Turkey has been trying to find moderates in Syria to create a political opposition to the Assad regime, find fighters (ph) and I guess, the simple question many of us would have is are there any Syrian moderates, and do they have any strength that would allow them to actually fight these very powerful forces like ISIS, al-Nusra, and the Assad regime? ERDOGAN (through translator): At the moment, there is a group of moderate opposition in Syria. This is our view, this is the U.S. view. But since the beginning, those — that moderate opposition was not really supported. It was just a few countries supporting that — Turkey, Qatar, and from time to time, Saudi Arabia. The Free Syrian Army, these moderate groups, were not supported. And that’s why things developed in the other direction. Now, is it possible to succeed? Well, failure is not an option. ISIS was born in Iraq, but it got stronger in Syria, because the environment was very conducive to them. ISIS is a spin-off of Al Qaida, and we were working against fighting against Al Qaida and other terrorist organizations, and we will continue to do that in the region. We have a border, which is 1,210 kilometers long. And we have to make this stand along this border. And we tell our friends, the United States included, that we should establish a no-fly zone along this border. If we can have a no-fly zone, then we could work more efficiently and we can break terrorists’ backs, as it were. But I have to say another thing. ISIS is using weapons. Whose weapons are they? In Iraq, those are the weapons that the United States gave to Iraq. And the Maliki government, the Maliki government, unfortunately, was an issue on which we were raising the red flag for many years, and we communicated this message to the U.S. officials, and we told them that they should not support Maliki, but they didn’t listen to us, and what happened in the end? Those weapons, that were given to them, to the Maliki government, fell in the hands of ISIS when the army deserted them in Mosul. And those tanks, artillery, have become part of the occupation effort carried out by ISIS. We say that a friend always speaks the plain truth. And as a friend, I have to speak the plain truth. Turkey and the United States, we are NATO members, we work together in Afghanistan, all countries (inaudible) and there are only four countries left: U.S., Germany, Italy, and Turkey. And the four of us will continue to work together in Afghanistan, with 10,000 troops. 6,000 come from the U.S., about 1,000 from Turkey, and the rest from Germany and Italy. So, there are — this is an area where we have so much solidarity. And we have to work together in the same way in Iraq. In Syria, if we had been able to work jointly from the very beginning, we would not be facing what we’re facing today. The Free Syrian Army had significant challenges, difficulties, in that process, and the Free Syrian Army, there are moderates who can support the Free Syrian Army now, and we need to strengthen them. Where Assad gets his support is well known. But if we consider Assad as a legitimate government, as a representative of a legitimate regime, then we would be wrong, because to me, he is using the state as a means for his — for terrorizing his people. And those who support him are making a historic mistake. More than 200,000 people have died in Syria so far, and close to 6 million people are displaced as a result of the developments there. But I find it very difficult to understand why the world is acting in the way that it’s acting. For example, the world is saying that we should act together to prevent chemical weapons. 1,600, 1,700, at most 2,000 people have been killed so far by the use of chemical weapons, but then again, 200,000 people have been killed by conventional weapons. So, it becomes a crime when they use chemical weapons and not so when it’s conventional weapons. I think we have to correct this logic somewhere. And until and unless we correct these mistakes, we will have issues. Syria has the Russian missiles now. And they use them. They use the tanks. They use the artillery they have. But the moderates don’t have such capabilities. So, if we are going to fulfill a humanitarian responsibility, then we have to really consider these factors. And we have to consider not just Iraq, but Iraq and Syria, as President Obama said on his — during his speech on that Wednesday.